The mechanically controlled break junction (MCBJ) technique is an approach to contact individual molecules. The idea is to fabricate nanocontacts by pulling a ductile metal wire until it narrows down and eventually breaks. Nanocontacts are usually fabricated on the flexible substrate, and the pulling is performed by its controlled bending. The key parameter of such system is a reduction, or attenuation, factor a = Δd/Δz between relative electrode displacement d and bending of the substrate z. The attenuation factor is defined by the geometry of the sample, and roughly can be estimated using the formula:a = 6uT/L2​, where u is a length of free-standing metallic bridge, T is a thickness of the substrate, and L is a distance between side counter supports. Historically, the first MCBJ devices were fabricated using notched metallic wire fixed on the substrate with epoxy. Such approach allows very easy fabricate the device without any special equipment, which allows to observe quantized conductance in metallic wires. However, the attenuation factor of notched-wire MCBJ is very small and reaches only about 10-2. Usage of lithographic techniques to fabricate MCBJ became very important improvement in the field. Towards that end, we prepattern metallic contacts via electron beam lithography on a flexible substrate (typically steel covered with polyimide) which can be placed into a three-point bending mechanism. For our geometry, this leads to the attenuation factor on the order of (1.5-4)·10-5​​. This allows us to tune the elongation of the wire and the resulting gap after it breaks with sub-angström precision. 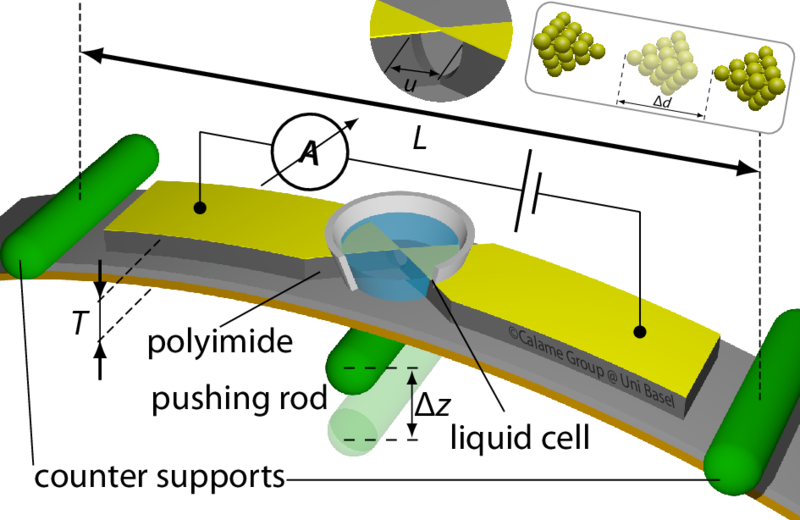 Finally, molecules can be added to the system via attaching a liquid cell with molecules in solution. When the wire breaks open, one or more molecules can spontaneously assemble between the contacts to form a molecular junction, which then can be studied using electronic and optoelectronic techniques.